There are two systemic pesticides that are used to treat HWA in New York: Imidacloprid (active ingredient) and Dinotefuran (active ingredient, brand names Safari™ 20SG and TransTect™). Imidacloprid is available to landowners only as a soil drench, however landowners may hire a certified applicator to apply Imidacloprid using other methods, some of which may be more appropriate for their individual property needs. The Best Management Practice (BMP) for treating HWA is a basal bark application. Basal bark application is the only application method allowed in New York State for Dinotefuran, and is the best application method for Imidacloprid. The product is applied as a low-pressure spray directly to the bark on the bottom four to five feet of a tree’s trunk until it just begins to drip and can penetrate the bark without surfactants. This method is faster and easier than stem injections, is non-invasive (does not require drilling into the tree for application), and can be used near water since the product is applied directly to the tree. Another benefit of the basal bark application is that Imidacloprid and Dinotefuran can be applied together as a tank mix, so the treatment will be fast-acting while providing long-lasting protection. Basal bark applications can only be carried out by certified pesticide applicators (with 2ee recommendation). With this application method there is less risk of uptake by non-target organisms during application than with other methods, making it an ecologically responsible choice. Treatment with just Imidacloprid alone typically costs about $0.75-0.80 per diameter-inch, while treatment with the tank mix of Imidacloprid and Dinotefuran is closer to $2.50 per diameter-inch. This is the only method available to private landowners without a pesticide applicator certification, and is only for Imidacloprid, not Dinotefuran. Imidacloprid is available at your local garden supply store or can be purchased online. The most common brand name is Bayer Advance Tree & Shrub. To apply a soil drench product to your hemlock tree, clear away leaves and organic material from two feet of area surrounding the base of the tree. Your Imidacloprid formulation should be applied to the mineral soil in the correct amount designated by the pesticide label. Always be sure to read the label directions and apply safely. It is best to apply soil drench during the fall or spring season when trees are actively transpiring and when soil is moist but not wet, such as after a rainstorm. Homeowners should be aware that soil drench application can move through porous soils and take precaution when applying near water or on steep slopes. It is advised that application of soil drench (or other soil applications such as soil injection) take place at a safe distance from water sources. Since the products used to treat HWA are systemic and work inside the tree, it is best to apply when the tree is actively transpiring and moving sap through the canopy. 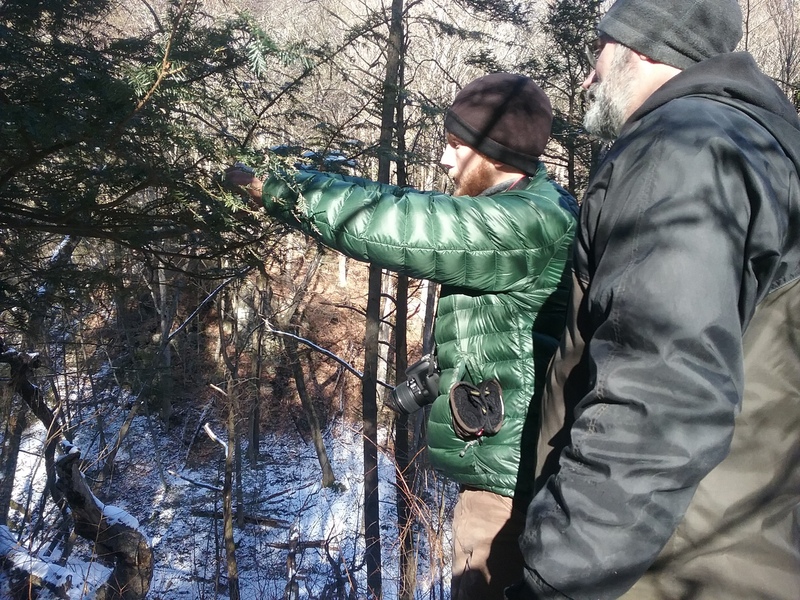 The spring season, after the ground has thawed, is the best time for treating hemlocks. Treatments may also take place during the fall season, when there is another period of active growth and transpiration. All methods covered here are only available for certified pesticide applicators. 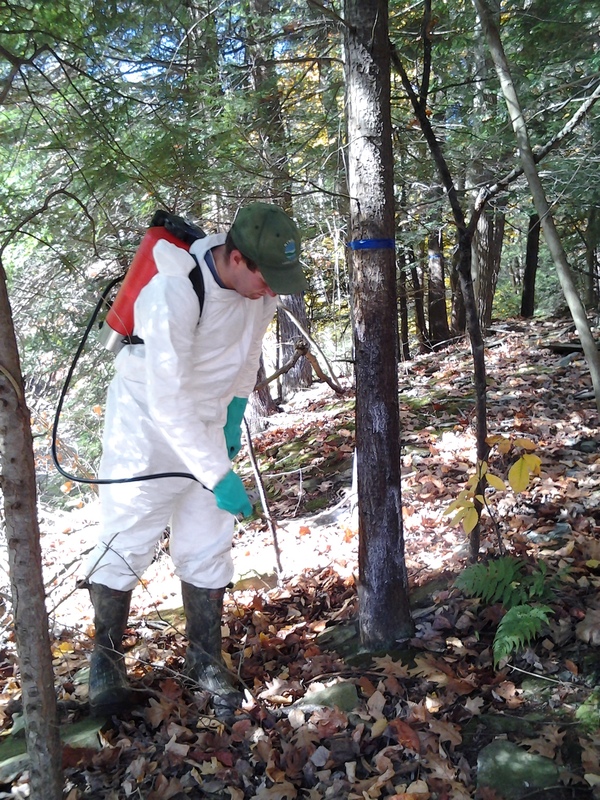 Imidacloprid is applied directly to soil at the base of a hemlock tree. This method works best during peak transpiration in the fall and spring, and when soil has already been moistened after a rain event. Time-release tablets are professionally applied in the mineral soil at the base of the tree. This application takes place regardless of the soil’s moisture content since the product will be released as the tablets become moist naturally. Core-Tect™ tablets release the tree’s dose slowly over two years, which means that twice as many trees per acre can be treated at once. Tablet application is also a good option when access and water are limited, making basal bark application impractical. Imidacloprid is applied directly into xylem tissue in the tree by drilling a small hole into the tree’s trunk. This method is a good option for treating trees near water as it is applied directly in the tree rather than in the soil, and so has a much smaller chance of ending up in waterways. It is more expensive than basal bark application of Imidacloprid. Additional information about Imidacloprid and its fate in the environment can be found on our Imidacloprid Information page.